This recipe comes from my good friend Heather. 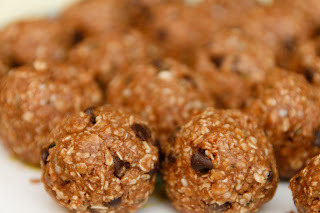 I've been in a bit of a snack rut lately and this is my new favourite afternoon snack. Along with a glass of iced chai. Remember my chai latté addiction? Well it has now morphed into an iced chai latte addiction. I've just started buying the Tazo chai concentrate and making myself iced chai at home. Next on my to-do list? Figure out how to make a homemade version that tastes just as good. Stay tuned. 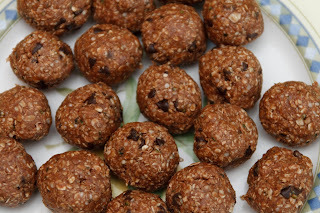 This is super, super quick to make, is no bake and is fully of all things good and healthy. A perfect snack or treat anytime. 1. Mix all ingredients together. Press into balls. Eat. Then just one last one. Before you hide them away. For 10 minutes later. And yup. Logan likes these guys too. Gluten-free if you use certified gf oats or quinoa flakes for added protein. If you use certified gf oats, you may want to pulse them briefly in a food processor if they are not quick-cook oats. I just made a quadruple batch and froze them. I think I will have to try this one! I promise you won't regret it! I just added instructions for a bigger batch, in case you want to do that instead - great for the freezer. YUMMY!!! I've been looking for recipes for quinoa! I'm DEFINITELY doing this tomorrow! Any idea what happens if you can't use quick cooking oats? (I think the gf oats aren't quick cooking but may be wrong!) also do you think quinoa flakes would work? @Nat - be sure to use quinoa flakes and not quinoa itself. It's like quick-cook oatmeal, a little smaller. You can get it in a health food store in the hot cereal section. @Kristy - The gf ones I bought are not quick cook. 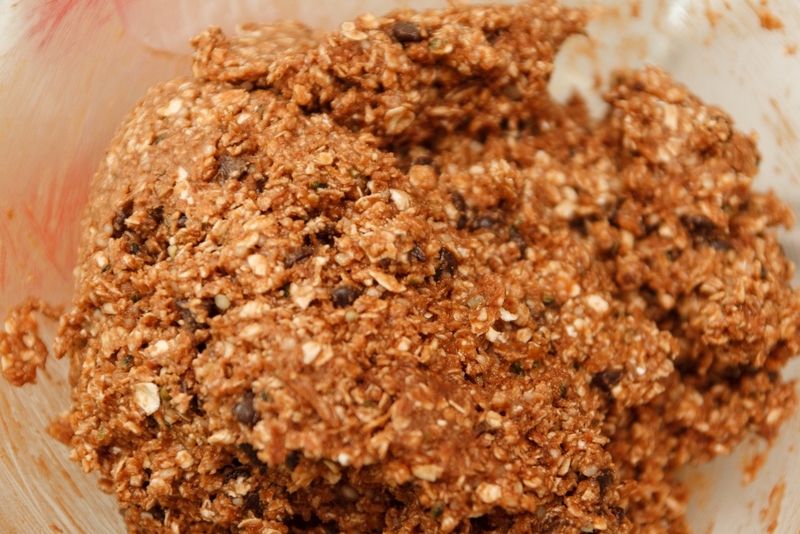 You could probably process them a bit in your food processor (pulse or they'll turn into oat bran). I just used quinoa flakes today, b/c it was easier. And it worked well - was just a little crunchier than with oatmeal. Sorry Linds - I read it off of my phone and missed that my answers were in the blog itself! Our Bulk Barn sells gf quick cooking oats. Maybe yours will too. I made these this morning. Looks like I don't need breakfast. Lol. Do you think they would work adding nuts and dried fruits? yup, probably. Maybe just add more pb if it doesn't stick. Ok, I'll let you know if it works once I try it! p.s. I guess that means you liked them? I think you're an evil genius for posting this - genius because they're delicious; evil because I can't stop enjoying their deliciousness. For those of you in the Lower Mainland, I found quinoa flakes in the non-organic bulk section of Save On Foods. I used chia in place of the hemp seed. Enjoy! Just remember that chia expands ... it's the only thing holding me back from a total pig out. Yep I liked them! I may make some more for this weekend! I may have to too. Even though I made a quadruple batch. It's the only snack I can really think of now that has some protein. "I forgot I was planning to make these tonight! I'm making bread instead :("
I decided this morning that breakfast was in need of dessert. Any tips for rolling the quinoa/hemp balls? I find it so sticky and hard to roll! I didn't roll them. Just bunch them in your hands into a ball. I eventually get them in a ball but find it hard. I'm tempted to put dry quinoa flakes on my hands to see if it helps! hey do you have to cook the oats or quinoa flakes? Not at all like the leaves of the cannabis plant, hemp seeds have no psychoactive properties at all. The minor seeds of a hemp plant can offer more protein than eggs, dairy or even some meat items. They contain the majority of the basic amino acids and basic unsaturated fats important for sound human life. I find a very good site for the weed list, You can visit this site.